Have you heard the old fable about boiling a frog? It goes something like this: if you drop a frog into boiling water, it will immediately jump out. But, if you place it in tepid water and slowly bring it to a boil, the frog will not perceive the rising temperature. However morbid the metaphor may be, it can teach us a thing or two about our unwillingness to react to threats that arise slowly. For example, hearing loss. Hearing loss is one of the most common work-related illnesses in the United States, according to the Centers for Disease Control and Prevention. And half of construction workers have some job-related hearing problem, including hearing loss or tinnitus (hearing a ringing, whistling, buzzing or humming noise all the time). In a recent study, the Center for Construction Research and Training (CWPR) discovered that one in four construction workers needs to shout on the job site “often” or “all the time”—signs that the job site is too loud—but nearly two thirds don’t wear personal protective equipment (PPE) during these times. In fact, it’s common for a construction worker to have the hearing of a worker twice his age, meaning a 25-year-old construction worker has the hearing of a 50-year-old. During the study, older workers also reported that it was often difficult to make younger workers believe that hearing loss was a real threat. Like a frog in boiling water, young construction workers don’t realize they’re in danger until it’s too late. That’s why they decided to launch new online training tools covering why noise and hearing loss is an important issue for construction workers, the signs and effects of hearing loss, common types and sources of hazardous noises, how to measure noise, ways to control noise exposure, and types of hearing protection. The training resources include a one-hour and a 30-minute module, alongside in-class and hands-on exercises and helpful handouts, for use as a stand-alone class or as part of a larger Occupational Safety and Health Administration (OSHA) training session. Visit here to check out the training resources. Although we recommend incorporating those resources into your training sessions and toolbox talks, here are a few immediate actions you can take to preserve your hearing and that of your crew. One of the most significant challenges is convincing workers that noise is a hazard to their hearing. Not only can hearing loss affect your long term health, it can also make it more difficult to hear warning signals on the job site and, since your hearing is tied to your equilibrium or balance, can increase the risk of falling. It can also contribute to loneliness and depression; lead to nervousness, sleeplessness, and fatigue; and increase stress, blood pressure, hypertension, and cardiovascular disease. Although there are a number of causes of hearing loss, including age, heredity and headphone use, the number one cause is exposure to loud noises. Do you have trouble hearing people talking when there is background noise? How often do you have to ask people to repeat what they say? Do you turn up the radio or TV a lot? Do you have trouble hearing people talking on the phone? Do you have a constant ringing in your ears? Gustafson said another sign of hearing loss is difficulty hearing high pitch frequencies and differentiating words that sound alike. Try this exercise: Right before work, turn down the radio in your car to the lowest volume at which you can still hear it. If you need to turn the radio up to hear it when you hop back into your car after work, it’s a sign that you’ve been exposed to hazardous noise levels throughout the day. Within the modules, there’s also an exercise, “What Does Hearing Loss Sound Like,” in which you’ll hear a number of noises at various stages of hearing loss to illustrate what may be in store for you if you don’t take precautions to protect your hearing. “One thing we wanted to express to trainees is that hearing loss isn’t just caused by one event,” Gustafson said. The damage to your hearing depends on how loud the noise is and how long you’ve been exposed to it. OSHA’s permissible exposure limits (PEL) for noise are up to 90 decibels for up to eight hours a day in construction, 95 dB for up to four hours, 100 dB for two hours, 105 dB for one hour, 110 dB for 30 minutes, and 115 dB for 15 minutes. According to a report from CPWR, construction workers are exposed to noise levels above the National Institute for Occupational Safety and Health (NIOSH) recommended exposure limits of 85 decibels 73 percent of the time they’re working. For reference, a normal conversation is about 60 dB, a hand drill is 98 dB, a spray painter is 105 dB, and a pneumatic precision drill is 119 dB. Visit NIOSH’s powertools database here to learn how loud other tools may be. Do you have to shout to be heard at arm’s length away? Do you have to turn off equipment to be heard? Do you have to move to another location to talk and be heard? Do you turn up the car radio at the end of the day? Another method would be to use a personal dosimeter, an in-ear dosimeter or a sound level meter to measure noise on your job site. You can also use NIOSH’s Sound Level Meter app for iPhones of the Sound Meter app for Android devices. “The sound level meter apps aren’t as accurate as the other equipment, but they’re readily available and keep improving,” Gustafson said. There are a number of ways to control construction noise. In decreasing levels of effectiveness, methods include eliminating the noise, buying quieter equipment and tools, controlling the noise hazard by isolating the source of the noise away from as many workers as possible, limiting how long any employee can work on a task above the recommended exposure time limits, and wearing appropriate PPE. OSHA recommends that employers should identify noisy tasks and develop a plan to control the noise beforehand, do a walk-around every day to ensure the plans are being implemented, monitor noise levels, provide hearing protection, and conduct training on said hearing protection. OSHA also recommends buying quieter equipment, adding that buying a tool just three decibels quieter will reduce the noise emitted by half. 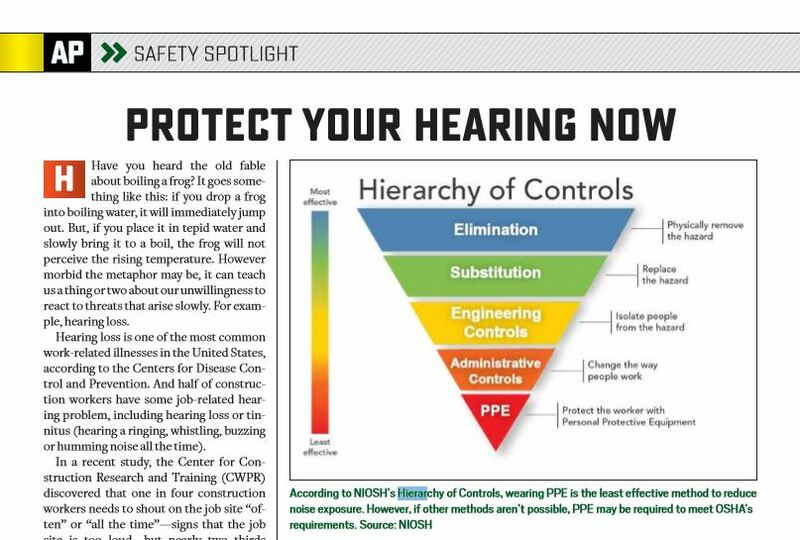 Check out the sidebar, “Choosing the Right PPE,” to determine the best hearing protection options for your crew, and be sure to check out CWPR’s training modules to really dig into the insights and ideas we’ve listed here. It’s never too late—or too early—to start protecting your hearing. 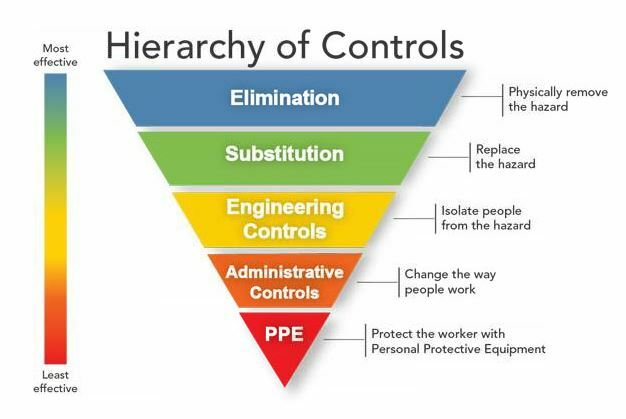 According to NIOSH’s Hierarchy of Controls, wearing PPE is the least effective method to reduce noise exposure. However, if other methods aren’t possible to implement, PPE may be required to meet OSHA’s requirements. Types of hearing protection include foam earplugs, reusable plugs, custom molded plugs and earmuffs to name a few. You should also look at convenience, comfort, communication needs, hygiene, hearing ability of the worker, noise level and noise reduction needed before choosing a solution. For example, foam plugs are easily available and offer a high level of noise reduction, but can introduce hygiene issues and take time to fit comfortably in the ear. Earmuffs are quick to put on and offer high noise reduction, but are often hot, heavy and cumbersome. You should also pay attention to the Noise Reduction Rating (NRR). This measurement can be found on the earplug package. The higher the number, the greater the protection. You’ll use this number and the noise exposure level of your work site to determine the noise exposure of your crew while wearing PPE. If your earplugs have an NRR of 33 and you’re experiencing an exposure level of 95 decibels, your level of protection is 82 decibels.